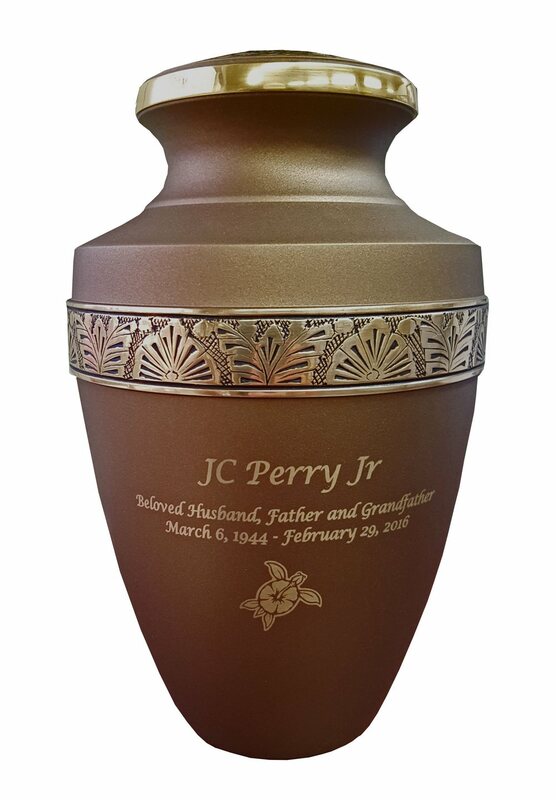 The Chestnut Brass Cremation Urn is expertly finished in a deep chestnut color which highlights the golden etched floral design on center. This urn has a threaded lid for security and easy loading. The urn can be engraved for an additional fee. Please limit engraving to no more than 40 spaces per line. Click on the tiny print and black and white images below the photo of the urn to view the engraving font styles and available clip-art. Please allow 1 - 2 business days for the engraving process before the urn ships. Non-engraved items usually ship the next business day after order is placed. Ships from the Midwest.